“How are you able to afford a year of travel?” It’s what everyone wonders but few really ask. My wife and I are in the second month of our yearlong road trip, and we’re happy to share our story and tips. First off, this article is based on our specific situation. This isn’t a one-size-fits-all process, but it’s how we assessed our situation, planned ahead, and took specific steps to fund a year of travel. For context, my wife and I are 25 years old. We got married at 21 (junior year of college) and from the outset had the goal of extended travel in mind. We have no kids, no pets, no house, and started adulthood with very little college debt. That said, we don’t expect our tips to work for everyone. We can’t speak for families of five with pets, a mortgage, etc. But we do hope to inspire anyone and everyone (potentially high schoolers, college students, and young adults) who aspires to take a gap year or travel extensively. 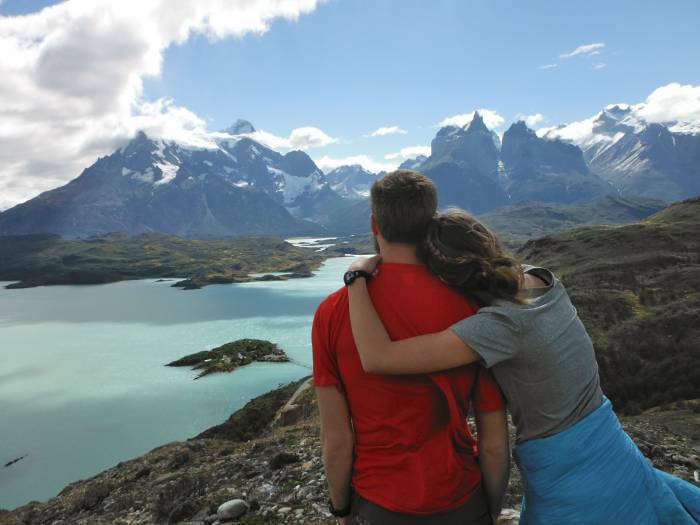 When we were newly dating, my wife and I studied abroad for a semester of college in Chile. We learned from the onset that traveling was a priority for both of us. We craved experiences instead of stuff. Through college and into marriage, we crafted ambitious bucket list travel experiences (from backpacking Europe to a yearlong USA road trip) and became more and more serious about carrying those out. With a few travel goals in mind, it helped us be more mindful of our five-year plan and our finances. In the back of our minds, we were preparing for a major adventure. That ultimately inspired us to take tangible steps to fund and plan it. Thankfully, neither of us left college with a significant amount of debt. Scholarships and family helped the cause. And within our first year in the real world, we had saved enough to snuff out the last couple thousand dollars of my loan. This saved us money by cutting out more interest accumulation, though it literally dropped our bank account to $1,000. About three months after graduating college, my wife and I both found very stable, career-worthy jobs. She was a registered nurse and found one of the many hospitals that were hiring. I left an internship at an advertising agency to start on contract as an editor/project manager at GearJunkie. With debt paid off and our frugal lifestyle (see next section), we were able to put my wife’s salary directly into savings. We made it hard to access so that we never touched it. It’s an incredible tip and a great way to develop the mindset that you’re living off of one income, not the sum of both (which would impact your shopping habits, hobbies, restaurant choices, etc.). If you’re single or just dating, the saving one person’s income might not be viable. But consider moving a large percentage of your salary directly into a savings account and living off the remainder. It will subtly impact your decisions, from the type of car you drive to the apartment amenities you can live without. Fortunately, my wife and I have a passion for travel and experience that far outweighs our desire for material objects (nice car, a big house, new clothes, etc.). That mindset helped us live in such a way that we could save the majority of our income. We found the cheapest (but still safe) one-bedroom apartment in the area of town we wanted to live in. It had no washing machine, no gym, no indoor parking, no dog park, etc. However, water, trash, heat/gas, and parking were all included in the rent. It was simple and just perfect for the two of us. To date, we’ve yet to own a house and take on mortgage payments. Additionally, we stuck with the cars we’d had since high school and college. They did the job and got us from point A to point B. I was lucky enough to live a few blocks from work, so my car was only driven a few times each month, saving me gas money. I biked a lot, and we always walked to the grocery store, restaurants, and coffee shops. To help us keep track of our spending, we used the free budgeting software Mint. With Mint, you can categorize all of your expenses, create budgets for each category, and create a goal that you can set aside money for. Every few weeks I would log in, categorize our expenses, and take a look at our progress for the month. Though we didn’t kill ourselves with strict budgeting, Mint was (and still is) helpful in keeping track of our money and finding ways to spend less money in certain categories. We worked our jobs and stayed in our same apartment for about 2.5 years. We had put enough money aside to afford our road trip vehicle. 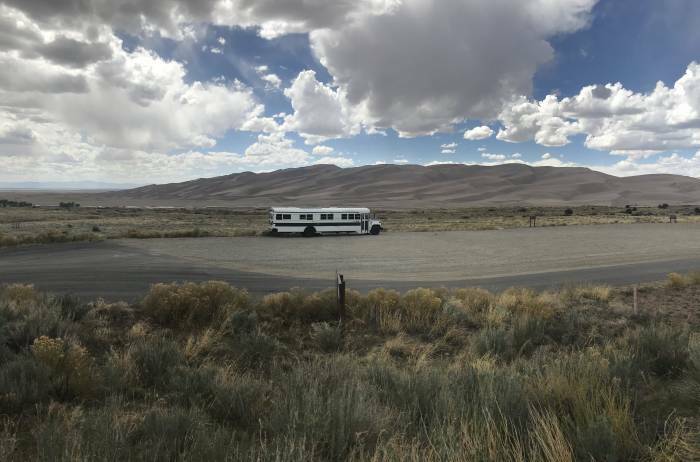 After looking around, we bought a beautiful skoolie (school bus converted to an RV) and set a departure date for 14 months in the future. This made our trip more real and pushed us to begin preparing for it. 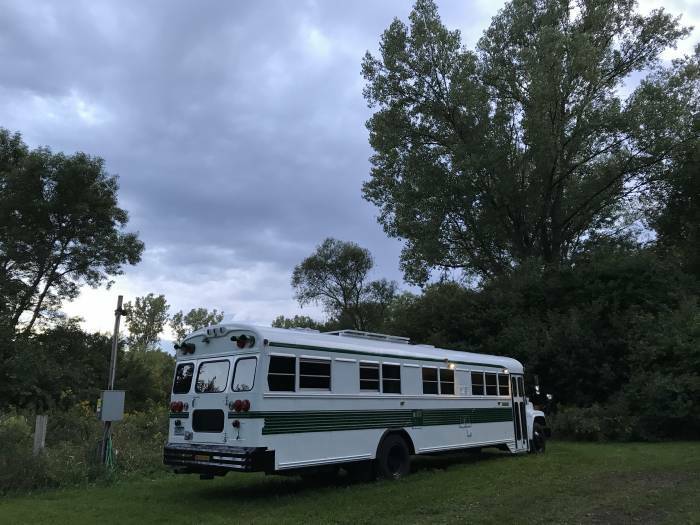 Once our apartment lease was up, we moved into the bus for four months of the summer on a friend’s property. During those four months, we literally had zero living expenses. No rent, electricity, no heat or A/C, no internet (just phone hotspots when needed, but yes, you can live without internet), no water, no nothing. We’re estimating that we saved about $5,000 during that time. About 14 months before our planned departure date, we sat down and estimated expenses for the year of travel. It included gas, campgrounds, food, excursions, vehicle repairs/maintenance, gear, and miscellaneous. After the dust settled, our maximum estimation came to $45,000. We hope to come in under that. A few qualifiers: The intention of this trip was to have the time of our lives. Our goal wasn’t to rough it and live as cheaply as possible. 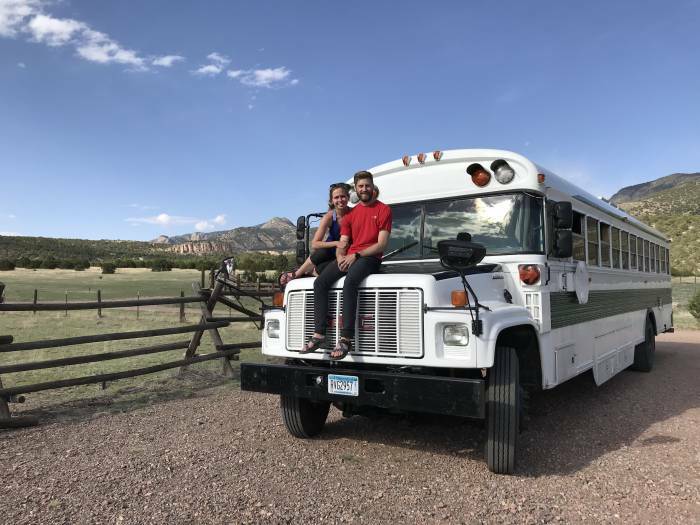 Also, we’re driving a school bus (not the best gas mileage), staying mostly in national park campgrounds (fee), and going on a few big excursions (rafting the Grand Canyon). Gas was estimated based on mileage (15,000 miles), vehicle fuel economy (8 mpg), and gas prices. Campground costs were based on an average campground fee ($25) and the number of nights we estimated we’d spend at campgrounds (280 nights). Food was based on our historical monthly spending. Excursion cost was kind of a shot in the dark (rafting the Grand Canyon was one of the only known and planned excursions). Vehicle repairs were also vague — and hopefully way overestimated. We also set aside a big chunk of change for miscellaneous items we forgot to consider. Once the yearlong trip expense was estimated, we plugged the $45,000 goal into Mint and set money aside each month for it (mostly my wife’s salary). The rough number helped us live the 14 months leading up to the trip more frugally and intelligently than usual while giving us a tangible, attainable savings goal to hit each month. You can make your dream trip happen. Whether your situation is similar to ours or is vastly different, there’s no reason you can’t set your mind to your most ambitious dream and make it happen. Extensive traveling when you retire is the more common route. But consider that you won’t be in the physical shape you’re in now to take on big, challenging adventures. We’re traveling now so that we can backcountry camp, climb tall peaks, and paddle big waters. We’re young, and a lot of our friends think we’re crazy. Sure, we could have bought a house, enjoyed pets, or started saving for a family. But we intentionally chose to blaze our own path and take life moment by moment. You might have similar worries and feel the pressure of the more traditional way to live and handle your money. Our biggest tip to affording to travel is to GO FOR IT. You won’t want to live life with “what ifs.” There’s no better time than now.